Tonya Harding is an American figure skating champion. Krusty the Clown staged in a press conference to defend himself against charges that his products are unsafe, his theme park is a death trap, and that he's marketing videos of Tonya Harding's wedding night. 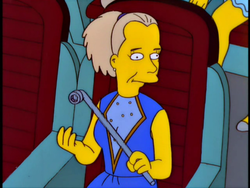 Professor Frink showed a clip of Tonya Harding attacking Nancy Kerrigan with a pipe whilst skating. She was seen on the rocket going into the sun to kill themselves. Harding attacking Nancy Kerrigan with a pipe is a reference to the attack on Nancy Kerrigan by a man hired by Harding's ex-husband. Modified on January 21, 2018, at 07:47.